↑ "Constitution of Georgia" (PDF). Parliament of Georgia. Archived from the original (PDF) on 10 ᱰᱤᱥᱮᱢᱵᱚᱨ 2017. ↑ Nakashidze, Malkhaz (2016). "Semi-presidentialism in Georgia". In Elgie, Robert; Moestrup, Sophia. 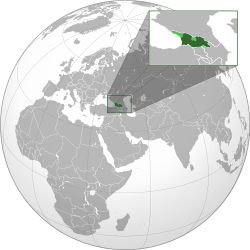 Semi-Presidentialism in the Caucasus and Central Asia. London: Palgrave Macmillan (published 15 ᱢᱮ 2016). pp. 119–142. doi:10.1057/978-1-137-38781-3_5. ISBN 978-1-137-38780-6. LCCN 2016939393. OCLC 6039793171. Nakashidze discusses the adoption and evolution of semi-presidentialism in Georgia since the Rose Revolution in 2004. From 2004 to 2012, political power was concentrated in the hands of the president, under a president-parliamentary variant of semi-presidentialism. Only during the period of cohabitation from 2012 to 2013 was the president's authority challenged. In 2010, the Constitution was amended with effect from 2013, reducing the power of the president considerably, arguably in an attempt by term-limited President Saakashvili to secure a political comeback as a powerful prime minister. Under the new premier-presidential Constitution, powers have been much more evenly distributed with each branch of government exercising its Constitutional powers. ↑ "საქართველოს პარლამენტმა მთავრობას ნდობა გამოუცხადა [ფოტო/ვიდეო] - 1TV". ↑ "Population". Retrieved 6 ᱚᱠᱴᱚᱵᱚᱨ 2017. ↑ "2014 General Population Census Main Results General Information — National Statistics Office of Georgia" (PDF). Retrieved 2 ᱢᱮ 2016. ↑ "Georgia – Gross domestic product". Retrieved 1 ᱱᱚᱵᱷᱮᱢᱵᱚᱨ 2017. ↑ "Georgia". International Monetary Fund.